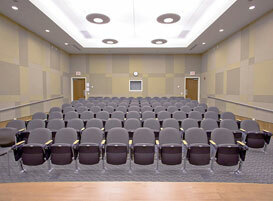 The Auditorium (Lecture Hall) has a seating capacity of 100. It features theatre-style seating facing the stage and a rear-screen projector. 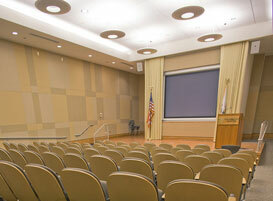 Technology in the auditorium includes an LCD projector and screen, computer, DVD and VHS players, and document camera. Both handheld and lavaliere microphones are available. Wi-Fi is available throughout the entire auditorium. Whiteboards are located in the front of the room for your display needs and videoconferencing is an option.